Allowing anyone in Rochester, NY to easily look into your store and check out your inventory could invite trouble. Burglaries, theft, violent crimes, and more can result when people on the streets can easily see your wares. Glass storefronts are the most vulnerable parts of any business in Rochester. Help prevent crime and keep your employees safe by investing in the right window tint. Although you want customers to see your window displays, you don’t want them to look into your entire store from the window. Giving people a clear look inside can give them information such as how many employees are on the clock, whether there is an exit door through the back, where you keep the cash register, and what high-value items you have for sale. Tinting your windows, on the other hand, could be enough to deter criminal activity at your business. If someone does decide to try to burglarize your building, breaking tinted glass won’t be as easy as shattering unprotected windows. Commercial window tint can provide a thick and secure film that keeps glass shards together if breakage occurs. Otherwise, your large windows could send dangerous pieces of glass throughout your store. Security tint can reduce the odds of break-ins, personal injuries, and expensive property damage. Your employees should feel that you have done as much as possible to create a safe working environment. Tinting the windows of your business can improve peace of mind by making it more difficult for strangers and criminals to see inside. For example, tinted windows can make it difficult or impossible for someone to see when an employee is counting the register at the end of a shift. 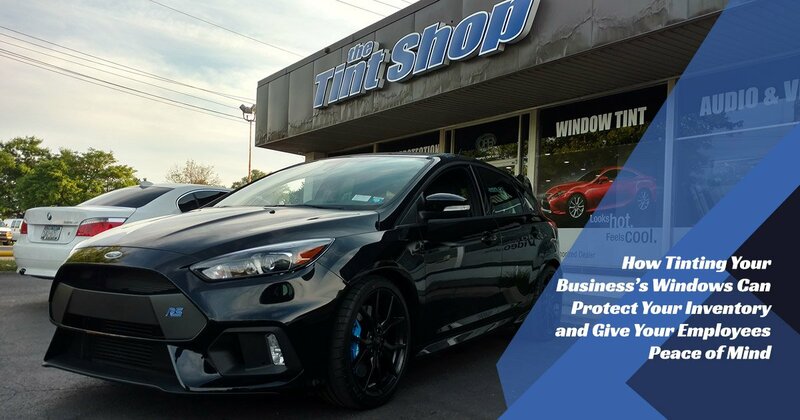 Tint your commercial window for optimal safety, security, and peace of mind with help from The Tint Shop in Rochester, NY.